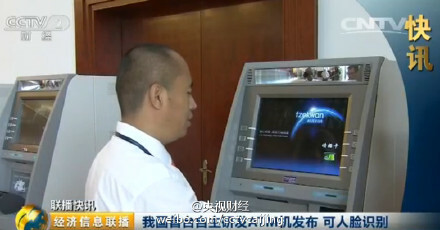 China has unveiled the world's first ATM with an inbuilt facial recognition feature on Friday. It is also China's first independently developed ATM. Clients who use other people's bank cards at such ATMs will not be able to withdraw money even if they know the password. Designed and produced by Tsinghua University and Hangzhou-based Tzekwan technology company, the new ATMs will be linked with banks and local police offices to crack down on financial crimes. The ATM is installed with a camera that captures the facial images and compares them with the ID photos of users for verification. Based on big data technology, including the identification of biological characteristics, the machine will be able to identify the cardholders if their facial features have changed, and avoid thieves who attempt to trick the machine. The ATM will also record the serial number of every note deposited by clients to identify fake bank notes. The independently developed ATM has been 20% more accurate when identifying and verifying the authenticity of multiple currencies when compared to an average ATM used globally. The transaction speed in the new ATM developed in China is also much higher.